They look like small petunias, and for years that’s what many botanists thought they were. More recently Calibrachoa came to be recognized as a separate genus. This plant spreads and mounds like petunias, but its 1-inch-wide flowers resist the geranium (tobacco) budworms that chew petunias. Since Calibrachoa freely drops its faded flowers, you never have to deadhead. 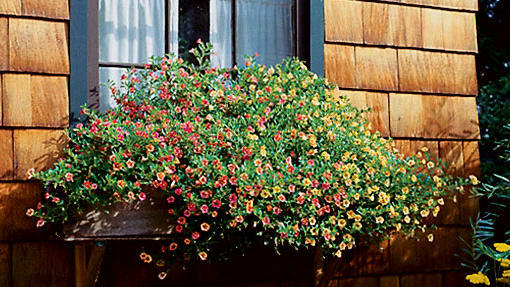 Treat Calibrachoa as a warm-season annual in Sunset climate zones 2-24. However, in mild-winter areas of California (zones 8, 9, 14-24), Calibrachoa can be grown as a perennial (it’s hardy to about 23°). Million Bells, the first series on the market, comes in both trailing and mounding forms. The new Superbells series has slightly larger blooms in the blue, pink, red, and white range. For warm tones, look for the MiniFamous series.